Why Choose A Timber Verandah? A timber verandah allows for more design capabilities. As well as a more tailored design for your home. Timber can be easily repainted if marked or if you want to change the colour. Timber Verandahs allow for a more rustic look giving your verandah & home more character. In addition to this if you live near the beach then timber would be a better choice. It is a lot more resistant to the salt in the air than steel which can corrode. In addition to this many customers choose timber verandahs over steel verandahs due to price. Timber is a lot cheaper than steel. 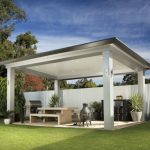 Why Choose a Steel Verandah? Steel verandahs are the more modern choice currently. Steel is more weather resistant (unless you are near the beach where you will be more susceptible to rust). By using colourbond products you know you will have a product that lasts for a long time. Even though steel verandahs are more expensive they are maintenance free for the lifetime of the pergola. So that further expense at the start will save you in the future. As well as helping with the resale of the home as it is a big benefit. Due to buyers wanting as less maintenance around the home as possible. Due to steel being stronger it allows for fewer support beams meaning fewer beams in the roof compared to timber which some people like due to it looking neater. Either way, you choose we can help you with both and are here to advise you on the best option. Call us today for a free quote on your steel verandah.